The next stage of the project is to test and validate the concept before finalising the full design. The tests that the inflatable structure will undergo are displacement, thermal and vacuum tests. These tests will validate the design of the inflatable structure before it is launched onboard the BEXUS16/17 high altitude balloon. The first stage of testing is to construct single cells using different glues. The glue which works best (strongest and easiest to use for manufacture) will be chosen to be used to manufacture the inflatable structure. 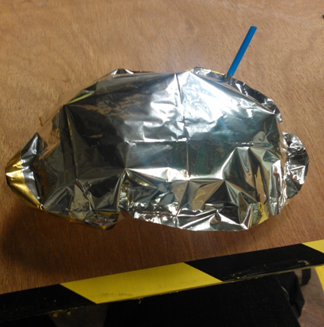 The picture below is an initial attempt of an inflatable single cell. The straw is used to inflate the structure. The next stage is to manufacture multiple cells which can be inflated by straws, before creating a full structure which can also be inflated by straws. Once a full structure has been manufactured the displacement tests will begin. A test frame has been created to test the displacement of the structure. 3 techniques have been proposed for measuring the displacement. The first is a laser or focused LED displacement technique. A mirror will be positioned on the bottom cell and the structure will be inflated. A light beam will be reflected by the mirror onto a photodiode array, when the structure is deflated and inflated. A second technique will use a piece of string attached to the bottom cell with a second measuring board positioned along the bottom of the test frame. The third technique will use a camera filming the structure inflating. Squares marked on perspex will be used as a reference to measure the displacement of the entire structure. 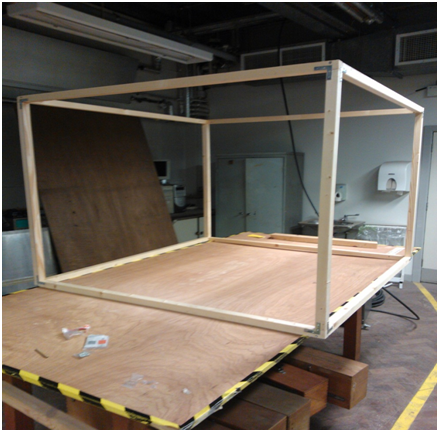 Below is the skeleton of the test frame. Measuring boards and full structures will be manufactured shortly. The second day of the selection event focused primarily on the REXUS sounding rocket experiment proposal presentations. There were 6 presentations including projects which measured CO2 concentration in the mesosphere, a novel method for attaching de-orbiting devices to space debris using expandable foam, an analysis of LASER welding in milli-gravity and an experiment to create milli-gravity. All presentations indicated significant research and development for all projects.